In this book, you will get a fresh and novel look at Finland with themes such as friendship, loneliness, romance, relationships, happiness, sadness, enthusiasm, depression, love, anger, satisfaction, and discontent. There are also generous doses of comedy, irony, drama, satire, empathy, and introspection. Analysis Of The Finnish Tango is a collection of flash fiction works and poems dealing with Finland, its society and its culture. These texts are not meant to be an accurate representation of the Finnish population. They are simply the author’s personal glimpses of people’s behavior, conversations around a dinner table, discussions in the sauna, chats in pubs, communications at the workplace and personal associations with Finns at large. Nevertheless, these works are fiction and not depictions of actual persons. At least that’s what the author is supposed to say, isn’t he? 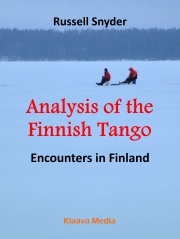 Download sample chapters of Analysis of the Finnish Tango -book in EPUB format. Kindle owners can follow the link below to Amazon for their sample copy. – and on other Amazon Kindle Stores across the world.